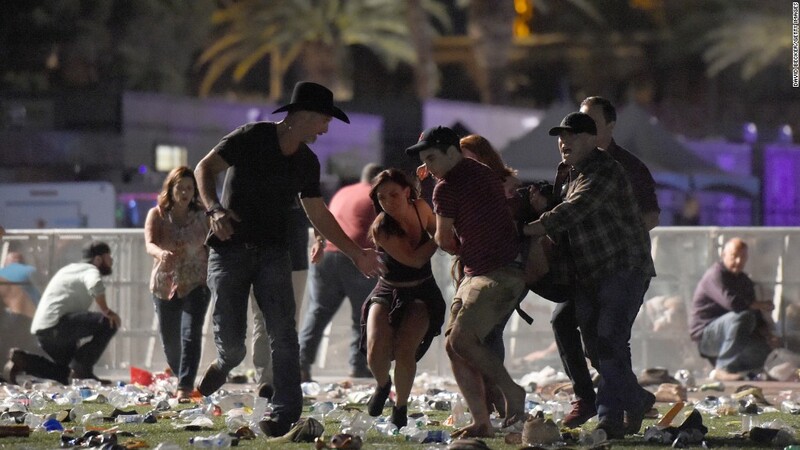 When news reports started trickling in Sunday night that a horrific attack had hit the Las Vegas strip during a huge country music festival, national media sprang into action as they always do during breaking news events. But by coincidence, coverage of the mass shooting collided with another big story that took place in Las Vegas over the weekend. Journalists had flooded into city to cover the release of former football star O.J. Simpson, who was freed after nine years in prison. Their assignments quickly changed just after 10:00 p.m. local time as the attack unfolded. "Had there been no O.J. Simpson release, far fewer [national/international] media would have been so close for initial shooting coverage," NBC's Kelly O'Donnell tweeted on Monday. Her colleague, NBC News correspondent Joe Fryer, was particularly close to the situation. After covering the Simpson release earlier on Sunday, Fryer headed to his room at the Four Seasons hotel, which is part of the Mandalay Bay Resort and Casino compound where the shooter fired at concertgoers from the 32nd floor. The shooting injured more than 500 people and claimed the lives of at least 58 others. Fryer called in from his hotel room and went live on MSNBC and NBC's overnight coverage. "We've been staying in the Las Vegas area because of the O.J. Simpson story that's been unfolding over the last 24 hours, so yeah we are currently in a lockdown in our hotel," Fryer said on air as another NBC correspondent Steve Patterson was on the street, broadcasting live. Fryer later posted footage of police going door-to-door to check on guests in the hotel. Fryer tweeted on Monday morning that the lockdown was lifted after 10 hours. CNN's Jean Casarez and Fox News' Adam Housley, who were also in Las Vegas covering Simpson's release, kicked into breaking news mode overnight as the situation unfolded. They stayed on air through the morning, interviewing witnesses. Ken Belson is on the NFL beat for the New York Times and was in Las Vegas for a reporting trip. His breaking news experience allowed him to kick into high gear during Sunday's attack. Belson's reporting on the mass shooting led the New York Times' homepage for most of Monday. Television networks also utilized their local affiliates, which were the first to break in to their broadcasts during the 10 p.m. hour, right before the regularly scheduled 11 p.m. live newscasts. Most national outlets picked up the news overnight, with most going live with news of the shooting at the 12 a.m. local time. All three broadcast networks are sending their anchors and many of their morning show hosts to Las Vegas for continuing coverage. Cable channels are also sending many of their main anchors to cover the aftermath and President Donald Trump's Wednesday visit. And as with most live concerts of this scale, photographers were already in place to cover the festivities. Thousands of country music fans descended on an empty lot near the Mandalay Bay Resort and Casino for the three-day-long Route 91 Harvest Festival. Photographers at the event turned into breaking news mode and captured grisly photos of the harrowing incident and its aftermath. David Becker was covering the festival for Getty. His timeline on the Getty images website shows a stunning change from musicians Jake Owen and Jason Aldean performing on stage, to bloodied bodies on the ground. On his personal Instagram page, Becker posted a photo of concertgoers running from the scene, writing in the caption "#enough. #stopthemadness #lasvegas."